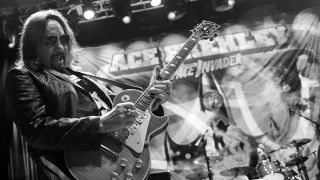 Ace Frehley says he won’t rule out a return to Kiss after his enjoyable recent collaboration with former bandmate Paul Stanley. Stanley provided guest vocals on Frehley’s cover version of Free hit Fire And Water for the guitarist’s solo album Origins Vol. 1 – due out on April 15 via Entertainment One. And Frehley says he’ll never rule out the possibility of teaming up with Stanley and Gene Simmons in Kiss. He tells One On One With Mitch Lafon: “We haven’t discussed that at this point, but I’m not ruling it out. I always leave the door open. I know there have been rumours and stuff, but there hasn’t been any talk of us getting back together. “Right now it’s just the excitement of this record, and I’m very excited about Fire And Water. There’s a good chance that we’re gonna release that as a single. Frehley previously said he’d hoped to have Simmons guest on the album, which also features contributions from Pearl Jam’s Mike McCready, Lita Ford, Slash and John 5. Stanley said he wished Frehley nothing but the best with the album and said working with him was a “terrific” experience. He continues his US tour in Florida on April 1.